CURRENT SPACE: The owners had a small sized kitchen that was not functioning very well. There was nowhere near enough storage space. 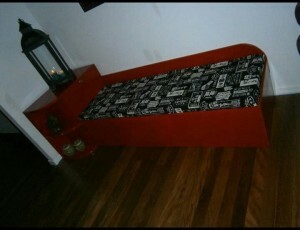 Next to the Kitchen they had placed a day bed that was crammed with stored items. CLIENT BRIEF: My clients initially wanted to update the kitchen, but the budget could not stretch to what was needed, to achieve their wish of lots of storage. I noted that there was a very under utilised alcove next to the kitchen, where the day bed was. I suggested that we could add built in storage to provide ample storage, and update the benchtops and handles in the kitchen for now, until a full renovation could take place. COMPLETED SPACE : The owners were thrilled with what was a very simple solution to a problem that had been driving them crazy! 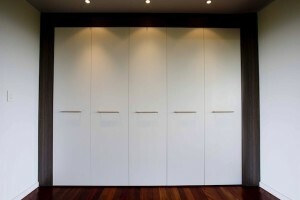 We transformed an unused portion of the room, into 4 metres of floor to ceiling storage. We used materials that could be repeated in the future kitchen making it appear twice its actual size.